We have had several new additions to our showroom this spring, many of which will be featured soon. However, one series has especially caught our eye, and we have yet to see anything else like it. W-Age tile from Provenza combines the durability of porcelain tile with the natural beauty of wood. 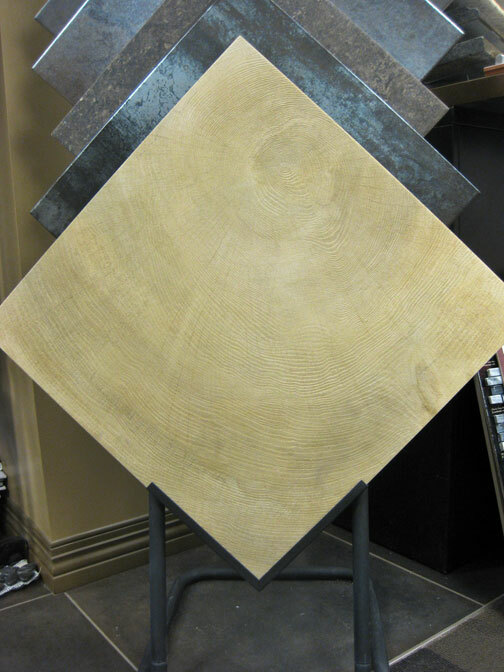 While wood-look floors have become more popular over the past several years, and many companies have their own edition. Most wood-look tiles mimic the shape and grain of hardwood floor planks, however Provenza shakes up this concept with their W-Age series by mimicing the end cut and resulting ring pattern of a tree's core. While these tiles are available in four different colors, the overall subtle pattern and texture give a soft, almost fossilized appearance rather than a loud and busy visual. "W-age combines the heart and essence of wood with the structure of a ceramic tile, its colours, patterns and surface reflections..."